Fiyawerx Productions presents FIYA BOMB featuring John Medeski, Chris Wood, Nikki Glaspieand Skerik at The Maison on Tuesday, May 1 at 10pm. Frenchmen is gonna get lit up! 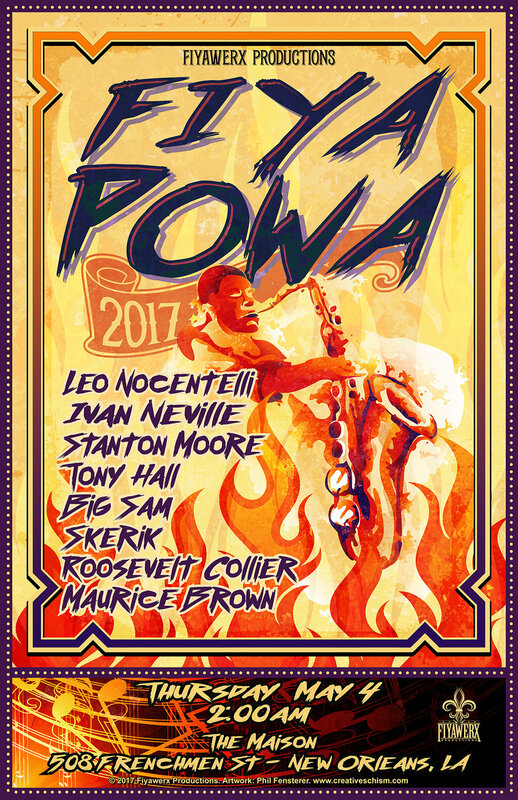 Fiyawerx Productions presents our 6th annual FIYA POWA featuring George Porter Jr., Ivan Neville, Karl Denson, Stanton Moore, Roosevelt Collier, Tony Hall, Big Sam and Maurice Brown at The Maison on Thursday, May 3 at 2am. Come light your late night flame with us on Frenchmen! Fiyawerx Productions is proud to announce GalactiPhunk with Ivan Neville, Stanton Moore, Tony Hall, Nick Daniels, Robert Mercurio, Ian Neville and Alvin Ford featuring Erica Falls plus The Naughty Professor Horns late night at The Maison on Saturday, May 5. Come get some Fiya on Frenchmen! Fiyawerx Productions presents SOULIVE w/ The Shady Horns on Saturday, May 6 at 2am. Come blast off with us deep into the night! It's on, y'all! Fiya Fest 2016, one of the best single day music festivals in the country. Head to Mardi Gras World on April 27th to catch some of the top musical performers, upholding the true NOLA traditions, not to mention a delicious crawfish boil. Plus, it's for a great cause. Fiya Fest is a large-scale crawfish boil, music festival and benefit for The New Orleans Musicians' Clinic. The cost of your ticket includes performances by over 95 amazing artists on 3 stages. Fiya Fest is held to benefit The New Orleans Musicians' Clinic (NOMC). The NOMC is a group that offers affordable health care options for the musicians of New Orleans. An incredibly worthy cause. Fiyawerx Productions is extremely proud to announce Fiya Fest 2016, one of the best single day music festivals in the country. Head to Mardi Gras World on April 27th to catch some of the top musical performers, upholding the true NOLA traditions, not to mention a delicious crawfish boil. Plus, it's for a great cause. LEO NOCENTELLI, OTEIL BURBRIDGE, KOFI BURBRIDGE, COREY HENRY, ERICA FALLS, FARNELL NEWTON, KHRIS ROYAL, ALVIN FORD JR.
David Shaw, Pete Murano, George Gekas, Rob Ingraham, Andrew Campanelli, Michael Girardot, Paulet Pj Howard and Mike Starr.